May improve the metabolic response to ageing. Contributes to the benefits of calorie restriction. Finding a way of stopping the ageing process has been the stuff of dreams for generations. But now it’s on the way to becoming reality as Australian and American scientists believe they’ve found a way of not just ‘pausing’ the ageing process but ‘rewinding’ it! Nicotinamide mononucleotide (NMN) is a precursor of NAD+ (nicotinamide adenine nucleotide) and NADH biosynthesis. This new compound should not, however, be confused with nicotinamide riboside (NR) and other substances already on the market even though they may share certain properties, particularly at a genetic level; NMN is significantly more powerful than NR. An experiment on NMN in mice conducted by Professor David Sinclair of Harvard Medical School has produced impressive clinical results and may lead to the development of new treatments to combat ageing and its associated diseases (cancer and type 2 diabetes). When Professor Sinclair and his colleagues injected this rare substance into two year-old mice, they observed, after just one week’s treatment, notable improvements to muscle (a reduction in muscle atrophy), enhanced insulin resistance and reduced inflammation, making the mice indistinguishable from younger animals. According to Dr Nigel Turner, a pharmacologist at the University of New South Wales,: “It’s like a 60 year-old being similar to a 20 year-old on some measures”. Professor Sinclair added: “If these results stand, then ageing may be a reversible condition, if it is caught early". The mitochondria are at the heart of the problem. When they stop communicating properly with the cell nucleus, it is almost as if the cells are deprived of their energy source or battery - their nuclei shrink and ageing becomes inevitable. For Professor David Sinclair, “The ageing process can be compared to a married couple - when they’re young, they communicate well, but over time, that communication breaks down. And just as with a married couple, restoring communication solved the problem”. This scientist therefore sees the decline in mitochondrial function and communication as a reversible process! He explains that NAD+ is the central pillar of cell communication but that it decreases sharply with age - until now, the only known way of preventing this loss has been through intensive exercise or calorie restriction. In a report published in the journal Cell, the researchers clearly show how the NMN injected into the animals converts into NAD to repair the compromised communication channels within a very short timescale - less than a week, in fact. The activity described by Professor Sinclair, who was previously responsible for research into resveratrol, highlights NMN’s ability to activate all seven of the SIRT genes involved in extending longevity. He believes nicotinamide mononucleotide could be a new class of ‘superdrug’ capable of both preventing diseases such as cancer (via inhibition of HIF-1, a molecule that impairs intracellular communication and plays a role in cancer development) and Parkinson's disease, and extending life expectancy to 150 years! Found in all living cells, NAD+ is a coenzyme involved in redox reactions. It consists of two nucleotides linked by their phosphate group. One nucleotide contains an adenine, the other a nicotinamide. It helps enzymes transfer electrons during redox reactions to form ATP and is thus an aid to energy supply. However, levels decline with age - the NAD+ in an older person’s cells will have fallen by more than 50%. The mitochondria then produce less energy and cells age. Fortunately, this process is not irreversible and intercellular energy mechanisms can be restored if levels of NAD+ are increased. In addition, NAD is an essential cofactor of key longevity enzymes called sirtuins, activating them directly. Sirtuins play a fundamental role in life expectancy as they deactivate particular genes that lead to ageing via inflammatory processes. Thus the combined fall in sirtuins 1 and 3, and in NAD+, can cause cerebral degeneration, vascular inflammation, fatigue, loss of muscle strength, increased fat stores around the liver and abdomen and insulin resistance leading directly to metabolic syndrome. All of these processes can be reversed by means of calorie restriction or supplementation with nicotinamide mononucleotide. NMN not only helps prolong life expectancy but has also shown promise in treating type 2 diabetes. This degenerative disease is directly linked to over-consumption of fat and calories which overwhelm adaptive metabolic pathways. Mouse studies showed that NMN improved glucose tolerance by restoring NAD+ levels. It enhanced insulin sensitivity in the liver, restored impaired gene expression related to oxidative stress, inflammatory response and the circadian rhythm by activating SIRT1. At a conference on the biology of ageing organised by the Ellison Medical Foundation, Dr Shin-Ichiro Imai demonstrated that sirtuins are necessary for calorie restriction to be able to improve the activity of orexin, a brain hormone which enhances cells’ sensitivity to insulin and prevents increases in body fat. However sirtuins alone are not enough - cellular NAD+ must also be present for these beneficial processes to work. The problem is, levels of NAD+ decline both with age and as a result of a high-fat diet. The good news, according to Dr Imai, is that in NMN-treated mice, researchers observed an increase in NAD+ synthesis, suggesting NMN could be a potential treatment for type 2 diabetes. In addition to this innovative formulation, you may also be interested in other anti-ageing supplements that offer effective and long-lasting protection from the effects of ageing. The potent AMPK Booster, for example, is formulated to reactivate AMPK, a key enzyme of metabolism, levels of which decline with age. The complex Natural Rapalogs contains five natural inhibitors of mTOR proteins, inhibition of which may combat premature ageing. You can also benefit from the optimised formulation Longevity Nutrients which combines a selection of natural anti-ageing nutrients. 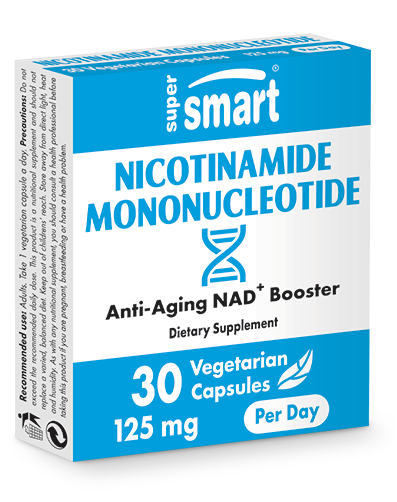 In humans as in mice, nicotinamide mononucleotide, at an average daily dose of 125mg - 1 capsule a day - could produce a natural reversal of the ageing process. According to Professor Sinclair, this substance is fast-acting and could also benefit young, healthy people. Adults. Take 1 capsule a day. Each capsule contains 125 mg of nicotinamide mononucleotide.